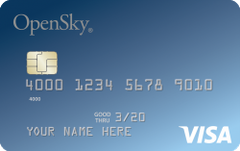 With a relatively low APR and annual fee, the OpenSky Secured Visa credit card is a great card for those with bad to fair credit. You won’t earn any rewards, but you’ll keep additional charges to a minimum, and you can qualify for the card without a credit check. When it comes to secured credit cards, the OpenSky Secured Visa is a pretty standard option. Your initial credit limit is equal to a security deposit, and you won’t earn any rewards. The additional perks with this card are limited, including only basics like fraud protection and account alerts. However, the low annual fee and APR set this card apart as a solid choice for those who need to build their credit over time, but still might need to carry a balance. If you have a less than ideal credit history – or no credit history at all – the OpenSky Secured Visa is a fantastic opportunity to start building your credit. OpenSky doesn’t require any credit check to apply for the card and offers everyone who is approved the same APR and credit limit range. Like most secured cards, the OpenSky Secured Visa requires a refundable security deposit up front to determine your initial credit limit. The beginning of the range is slightly lower than average, at $200, and you’ll be able to deposit as much as $3,000. If you have the money for a larger deposit, this can make a huge difference toward improving your credit score. One downside to this card is that there is no specified policy for applying for a credit limit increase. That means you’ll be limited to the deposit you can afford. If you aren’t able to choose a higher credit limit, you might consider a card with regular reviews for a credit line increase. While it’s true there are secured cards out there with no annual fee, the OpenSky Secured Visa fee of $35 is still relatively low. Many similar cards will charge $50 or even $75 on top of higher APRs. If a low interest rate is on the top of your priority list, this card could be worth the investment. The lower than average APR definitely sets the OpenSky Secured Visa apart from other secured cards. While many cards that are designed for those with bad to fair credit charge upwards of 20 or even 25 percent, the OpenSky Secured Visa only charges 19.64 percent (variable). Best of all, everyone who is approved for this card gets this same APR, so you don’t have to worry about falling toward the high end of a range. These few percentage points can make a big difference if you are trying to improve your credit but still might need to carry a balance. In general, 19.64 percent is still a high APR, so you’ll want to pay your bill in full whenever possible. The OpenSky Secured Visa doesn’t have any sort of rewards program and only includes basic benefits. You’ll enjoy $0 fraud liability and auto rental insurance, but not much else. If earning rewards is important to you, this is probably not your best choice. But keep in mind that credit building cards with rewards programs typically come with a higher APR. The OpenSky Secured Visa is not a card to open and forget. If you don’t have any activity on your account for a year, you’ll be charged $10 per month as an inactive account fee. Continue to make payments using this card – even small ones – until you are ready to close the account. Why get the OpenSky Secured Visa Credit Card? You have bad to fair credit or no credit history and need a card with a low barrier to entry. You plan to carry a balance and need a lower APR. Lower fees and interest rates are more important to you than a rewards program. Make as large of a security deposit as possible to boost your credit limit and improve your credit score. Make payments regularly to avoid an inactive account fee. Pay off your balance in full whenever possible to avoid racking up interest charges.